where Prob(i) is the probability that the Predictor has assigned to the winnng team in game i, and the log is to base 2. This metric rewards Predictors for probability assessments of the winning team that are closer to 1, but heavily penalises probability assessments that are close to 1 if they're made for the team that eventually loses. With a little maths, it's not hard to show that the optimal probability to assign to team X in game i is the a priori probability of team X winning game i. As such, the metric rewards calibration. First, let's consider Kelly-staking each game on the basis of our probability predictions. 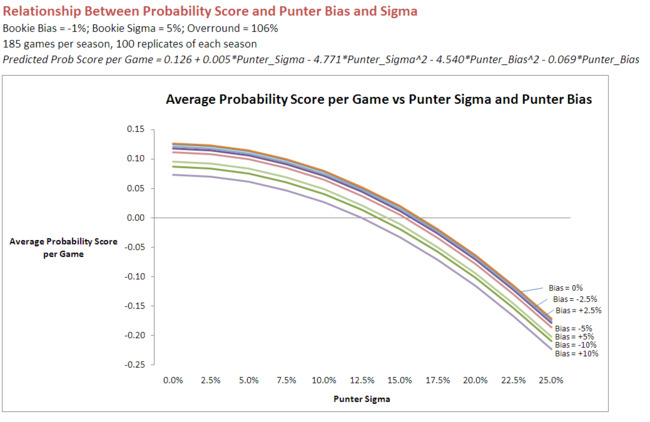 So, regardless of the Punter Sigma or Bias values that produced the Probability Score that we witnessed, if the Probability Score exceed 0.035 per game there's about a 90% chance that it was associated with profitable Kelly-staking. A relationship exists between the Probability Score that a Predictor produces and the Bias and Sigma that produced it. A little equation-fitting with Eureqa produces an empircal description of that relationship for the data from the simulations that explains 99.8% of the variability in Probability Scores. It's interesting to note how the curves, each pertaining to a different value for Bias, fall off initially quite slowly with increasing Sigma. Only when Sigma reaches about 10% do we find significant Probability Score penalties for increased variability. For a given value of Sigma, the penalty for Bias is such that moving from a zero Bias to a -10% Bias (ie in the same direction as the Bookie's own Bias) leads to an expected reduction in Probability Score of 0.038 per game, while moving from a zero Bias to a +10% Bias (ie in the opposite direction to the Bookie's Bias) leads to an expected reduction in Probability Score of 0.052 per game. Knowing as we do know that a Probability Score of 0.035 per game makes it quite likely that a Kelly-staking punter will be profitable, we can use this equation to determine what combinations of Bias and Sigma will produce Probability Scores of at 0.035 per game or more (given all the assumptions we've made earlier about overround, bookie bias and bookie variability). A Kelly-staking punter with low variability (Sigma) can turn a profit from a broad range of biases. As Sigma increases, the profit-making range of biases shrinks until a Sigma of just under 14% is reached, at which point a profit isn't possible regardless of the size (or complete absence) of any bias. Comparing these rules to the ones we created previously for Kelly-staking we can see that profitability is possible with smaller probability scores if we use Level-staking instead of Kelly-staking. For now that leaves just one obvious, unanswered question: given that I know the probability score my probability assessments are producing, should I Level-stake or Kelly-stake?